The Alaska Education Tax Credit Program was created in 1987 to allow businesses to donate to educational institutions and programs in return for substantial tax credits. Nearly every school and education program in Alaska is eligible to receive donations through the program and businesses can use the tax credits to reduce their tax liability for corporate and other state taxes, including the oil and gas production tax, the fisheries business tax, and the mining license tax. Now that HB 233 has become law, for the next two years, businesses can receive a 50 percent tax credit for the first $100,000 in donations. The tax credit percentage goes up to 75 percent for donations between $100,000 and $300,000. Donations above $300,000 result in a 50 percent tax credit. In 2021, all donations will result in a 50 percent tax credit. House Bill 233 passed the Alaska House of Representatives in April of this year by a vote of 38-1. The Alaska State Senate passed the bill unanimously on the final day of the Second Session of the 30th Alaska State Legislature. 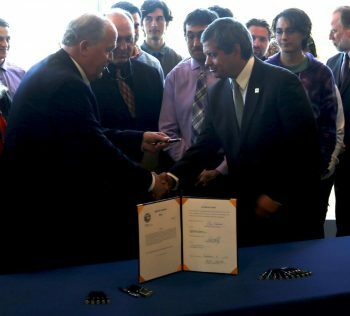 Alaska Governor Bill Walker signed the bill into law today at the University of Alaska Anchorage surrounded by university students and education stakeholders from across the state. The ceremony was held in the UAA Engineering Building, which is one of the buildings in the University of Alaska system to benefit from the Alaska Education Tax Credit Program.